SINGAPORE COMICS & COLLECTIBLES: JUSTICE SOCIETY OF AMERICA #28 (2009) "Whiteout!" JUSTICE SOCIETY OF AMERICA #28 (2009) "Whiteout!" • PLOT SUMMARY: "Phantom Menace." Written by Jerry Ordway. Art by Jerry Ordway and Bob Wiacek. Cover by Jerry Ordway. 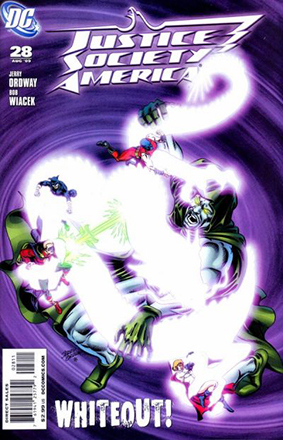 A Japanese spirit has appeared to exact revenge on the living symbols of America's atomic warfare while the rest of the JSA reaches out to another founding member for assistance: The Spectre!